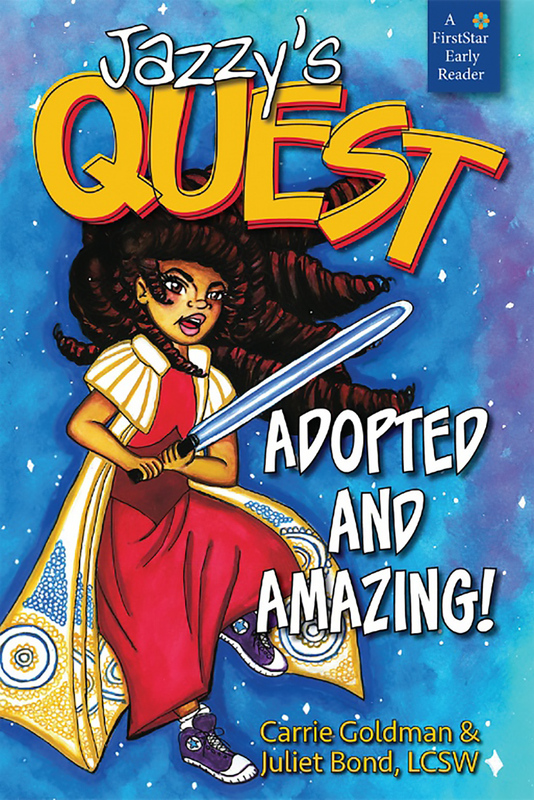 Portrait of an Adoption, a blog followed by readers in over 45 countries, is excited to introduce you to our fictional chapter book series, Jazzy's Quest: Adopted and Amazing! There is a story behind the writing of this series. My initial inspiration for Jazzy’s Quest came from my daughter, Katie. We adopted Katie out of foster care when she was a baby. When she was almost six years old, her birthmother reached out and asked us to come visit, and we began taking Katie for annual reunions with her birthmother and siblings. We didn't know any families like ours! In Katie's early years, we read books to her that explained what it means to be adopted. The books were designed to reassure her that we want and love her. Most were written from the viewpoint of an adoptive parent. As Katie grew older, she naturally moved away from picture books and entered the fantastic world of reading beginner chapter books. Oh, yes, how she loved The Magic Treehouse books and the Ivy & Bean books and other starter books! But we noticed a problem – none of the books featured a modern adoptee like Katie as the protagonist. As children develop into readers, they think more about the world in which they live. They look to identify with a character, to find a common thread or a similar perspective. We found beginning chapter books that struck a responsive chord with Katie in almost every aspect of her identity – Star Wars books for the fangirl inside her, stories about Judaism for the Jewish girl inside her, adventure books for the explorer inside her – but we found next to nothing for the sometimes-struggling adoptee inside her. Kids need to be able to acknowledge their identities in order to be whole. As an independent reader, our daughter wanted to find chapter books that featured adoptees. Our only options were beginning reader fairy tales, but the adoptees in those books were usually helpless young women whose parents mysteriously died, leaving them at the mercy of cruel step-parents until a handsome prince saved them. Not the model we wanted for our daughter. Being adopted is hard for many people. There is a lifelong search for self that occurs in many adoptees, and I noticed a sense of isolation in my daughter, a lack of shared identity with other children. For many adoptees, the experience of feeling isolated really accelerates as they enter the tween years. At the same time that I was seeking out adoption books for my daughter, I happened to be having coffee with my friend, talented children’s author and adoption social worker, Juliet Bond. Juliet is a passionate advocate for girls and women. Not only has she written the esteemed children's adoption book Sam's Sister, she also writes about issues close to my heart, such as the unhealthy sexualization of girls. Her fight against her daughter's school dress code kicked off an international discussion last year. Juliet is a pro at writing children's books that feature diverse characters, and she is experienced at writing for children who read beginner and middle-grade chapter books. Together, Juliet and I decided to create a new genre: fictional beginning chapter readers for adoptees that feature strong, empowered female protagonists. After dozens of drafts, we settled on the storyline for Jazzy’s Quest. I drew heavily from the shared experiences of my thousands of readers at my blog, Portrait of an Adoption, and Katie was instrumental in providing authentic tween adoptee insight. Fourth grader Jasmine is the youngest of three children, and the only adoptee in the musically gifted Amazing Armstrong family. But secretly, Jasmine doesn’t like to sing or play instruments. The big community talent show is approaching, and Jasmine must scramble to figure out what her act will be. Will her birth family be able to help? How will Jasmine discover what makes her amazing? A passionate Star Wars fan with a keen interest in making intricate costumes, Jasmine learns to follow her own path, with the support of both her families. Because there are SO many types of adoptees, we decided to make Jazzy’s Quest into a series, which will allow us to create characters that represent the many perspectives of an adoptee. Jazzy is always the main character, but we will feature other types of adoptees throughout. For example, Jazzy’s family has an open adoption. But at the end of the first book, Jazzy meets Michael, a boy who has a closed adoption from foster care. Michael’s storyline is a main subplot in the second book in the series, which was published in September of 2016. We have incorporated multiple themes into Jazzy’s Quest. Like my daughter, Katie, Jazzy is a female Star Wars fan, because gender shouldn’t determine what toys you like to play with! One of Jazzy’s best friends – a main character named Alec – happens to be in a wheelchair, because kids of all abilities should be represented in children’s literature. The story is fun and engaging for any child to read, but it contains an emotional intelligence that speaks keenly to those touched by adoption.